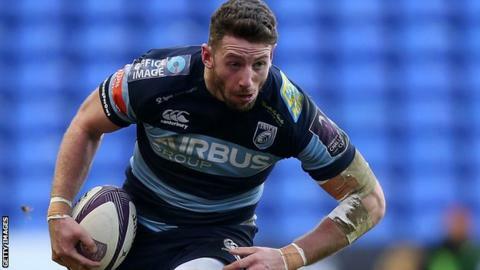 Wales wing Alex Cuthbert has agreed a new deal with Cardiff Blues. The 26-year-old has scored 15 tries in 42 appearances for Wales and had been linked with potential moves to either Worcester or Leinster. Cuthbert is sidelined following knee surgery which will keep him out of the summer tour of New Zealand. The contract is with the Blues only, after Wales coach Warren Gatland revealed in January that the player had turned down a National Dual Contract. "Alex has played exceptionally well for Cardiff Blues since returning from the Rugby World Cup and we're excited that he has now committed his future to us," said Blues head coach Danny Wilson. "He is undoubtedly a high quality international winger who is determined to improve year on year." "It's fantastic that he has committed himself to staying. The more of our players of that calibre and experience we can keep in Wales the better. It's not only of benefit to the club on the pitch, but also to the youngsters in the club, seeing a role model and learning from them and gaining experience." Cuthbert added: "I'm pleased to sign a new contract at Cardiff Blues and looking forward to getting back to full fitness and the start of next season." The Gloucester-born former Hartpury College player made a big impact when he broke into the Wales team following the 2011 World Cup. He scored the crucial try when Wales beat France 16-9 to clinch the 2012 Six Nations Grand Slam. A year later he scored two tries in Wales' 30-3 defeat of England to clinch the 2013 title and also scored on his Test debut for the British and Irish Lions against Australia. However, Cuthbert's form has suffered in the past year and he has not scored a try in his last nine international appearances. He made his debut for the Blues in the 2011 season and signed a three-year contract in December 2012 when he had been linked with Toulon and Racing Metro in France.